"Potatoes are tossed in a garlicky dill butter before being served in this fantastic side dish." I really enjoyed this side dish! My husband asks me to make it all the time with fish. I do put it in the oven at 350 to let the garlic and dill infuse the potatoes. I boiled the potatoes in generously salted water, rather than steaming them - they were yummy! The garlic dill butter is also very good over green beans. These are the BEST potatoes I've ever eaten! I had to boil the potatoes because I didn't have a steamer basket, and I used dried dill because I had it on hand. 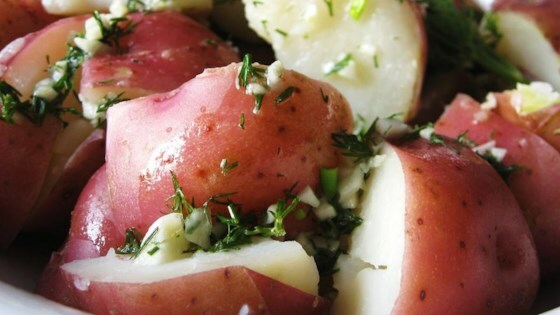 My husband and I really loved this recipe.I steamed the potatoes a little longer to get them more done. Will definitely be making this again.